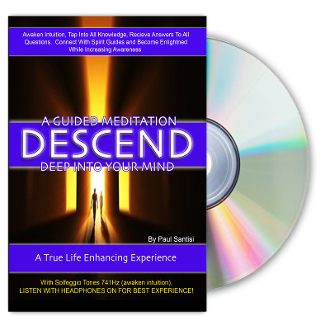 may you never be the same >> 2 CD SET Descend Deep Into Your Mind "AWAKEN INTUITION"
2 CD SET Descend Deep Into Your Mind "AWAKEN INTUITION"
This powerfully effective guided meditation will bring you DEEP into your own subconscious mind. Where you will awaken inner intuition, rejuvenate your body and soul. Gain infinite wisdom from spirit guides and knowledge for all of your life questions. Uses Alpha, Beta, Theta, and Delta Brainwave Frequency's as well as 741hz Solfeggio Tones (awaken intuition). LISTEN WITH HEADPHONES ON - OR YOU WILL NOT GET THE DESIRED RESULTS! Also this audio will make you very relaxed - Do not listen while driving. This audio works automatically at the subconsciuos level. POWERFULLY AWESOME EXPERIENCE!